Of course the lens is chosen regarding the scene. Note that you don t need lenses with big aperture like 2.8 because you will need time to paint and therefore a very low shutter speed = small aperture. 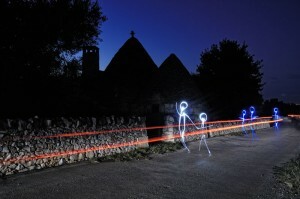 I started doing light painting with a 18-70mm 3.5-4.5 and I often use it at F/9, F/16. 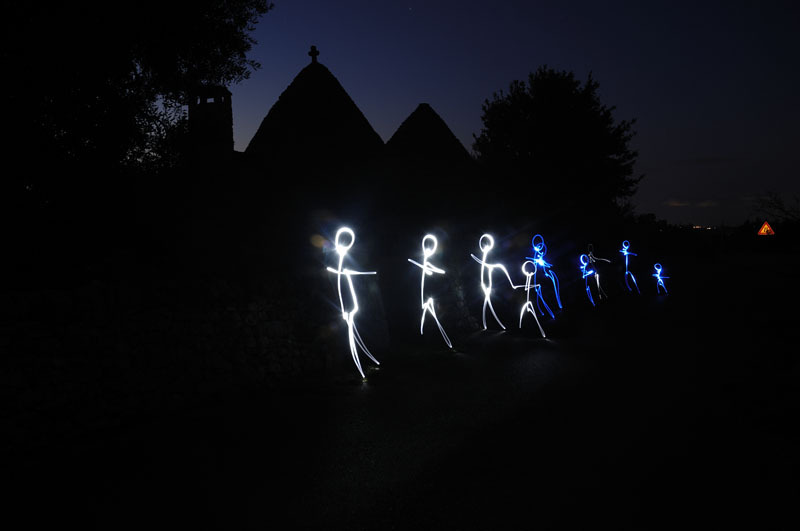 The flash fixes people and objects on the scene so they are clearly visible even for long exposure photographs. For example, on “Light soccer”, I was flashed at the beginning of the shooting. Well you will need a tripod of course. Be sure to get one that supports the weight of your camera + lens and that is high enough for you. Another great tool to reduce camera shake and blurry photographs is a remote shutter release that allows you to block the shutter opened as long as you want. *Wear dark clothes! That will decrease the chance of you being visible on the image if you stay at the same spot while painting. It is important to start, shooting at the scene without painting to setup the camera as best as you can in order to get a well exposed, well framed scene and a shutter speed slow enough. All you have to think about is pointing the light to the lens. Don’t worry if you need lasers, they won’t damage your camera’s captor! If you want to integrate lights from a car for example, start the shooting when the car is about to appear on the scene. By the way, you can use lights from cars to light the scene. In urban scene, the light is often yellow… that is why all my first light paintings are yellow. In order to get the right white balance, you can use a compact grey chart like the one from TrueColors. It can be difficult to setup the focus in a dark place. Use one of your torches to light an area of the scene and make the camera focus on it. Once done, put the focus on manual so it won’t change while shooting. Different settings have to be setup in order to get the shutter speed you need. Low ISO decreases the sensibility and the noise on long exposure photographs. The aperture changes the depth of field and a small aperture means slower shutter speed when shooting dark scenes. The shutter speed can be as low as you want. Just be sure that the scene is well exposed. “Sunny night” ‘s exposure time is around 16minutes. There were no lights at all in the streets. The scene lightning comes from the moon.